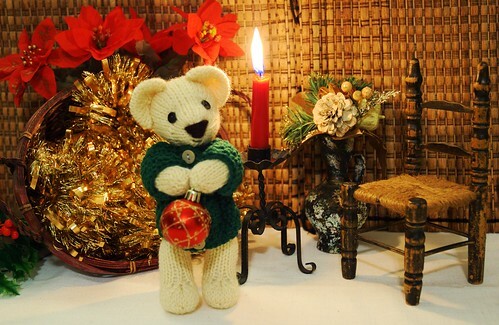 How about some knitted mistletoe or holly? November 17, 2009 at 11:01 a.m.
How about a wee mug of cocoa? November 17, 2009 at 12:11 p.m.
How about a nice holiday dress or suit. November 17, 2009 at 12:25 p.m. I'd love a pattern for a pretty Christmas dress. November 17, 2009 at 1:27 p.m. It isn't festive - but what about a little sleeping bag for the animals and a pillow. I could see that, combined with an animal and some clothes as being a wonderful gift for a child. November 17, 2009 at 1:39 p.m.
How about a festive sweater for the bunny? The one with nordic design or maybe intrasia design? That would make my bunny complete and ready for the holidays! November 17, 2009 at 3:51 p.m. I have really been looking for a Christmas Elf pattern. Like a shelf Elf that spys on kids for Santa and moves around the house. Sometimes he kind of hides so they don't know he is there. Can't find anything I like. You would be just the designer to do the job! What do you think? November 17, 2009 at 5:20 p.m.
A simple to knit coat or jacket would be wonderful, but anything you think you have the time for will be great!!!! November 17, 2009 at 5:22 p.m. I like the Xmas elf idea a lot...original and unique. go for it! Please? November 17, 2009 at 5:36 p.m. I second the sleeping bag and pillow idea. My granddaughters would love that. November 17, 2009 at 5:43 p.m.
An elf or a festive Christmas dress or sweater for the wee critters would both be lovely! November 17, 2009 at 6:25 p.m. I really like the idea about a sleeping bag and pillow, as well as the idea of an elf. November 17, 2009 at 10:45 p.m. I would like to see a hat and scarf set that can fit most of the Fuzzy Mitten gang. November 18, 2009 at 12:50 a.m.
How about a little snowman with a hat. I´would love that for the rabbit´s playground at winter time. November 18, 2009 at 8:54 a.m. I would really love an adorable Christmas mouse! I had a silly Christmas mouse decoration as a kid and loved it!!! November 18, 2009 at 9:38 a.m. I would love to see a holiday sweater pattern to dress my bunny. November 18, 2009 at 10:57 a.m.
All those people left the comments have great ideas but how about this elf with small body, small hat and skinny legs with pompoms? Would that be a neat way to add to the Christmas tree? November 18, 2009 at 2:59 p.m.
A mouse or an elf! November 18, 2009 at 3:35 p.m. So many great ideas have already been posted. I love the Christmas mouse, elf, and sleeping bag/pillow ideas. My idea would be a skirt pattern. Something that I could pair up with the shirts/sweaters from the clothing bundles that I already own. November 19, 2009 at 5:28 p.m. Yes To the elf!!!!! For sure, PLEASE!!!! November 20, 2009 at 12:08 a.m.